A record-breaking number of entrants are set to take part in a popular north east event. The Kielder Run-Bike-Run, part of the Kielder Marathon weekend, is full to capacity for the first time. The relay event, which will see nearly 300 participants tackle the marathon distance split into three parts either individually or in teams of three – an 11km run, a 26km bike ride and a 5km run - is one of the Kielder Marathon weekend of activities taking place on Saturday 5 and Sunday 6 October 2013 in Northumberland. This means more than 200 bikes will be in use at the transition stations for the Run-Bike-Run! Organisers have over 1160 people numbered to take part in the marathon itself while the Kielder 10K has 654 entrants – a record number of participants and more than double the number in 2011. 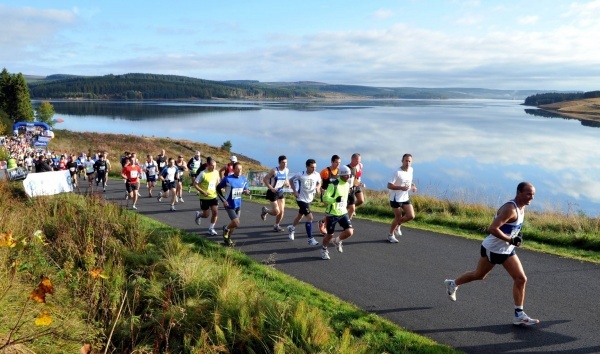 Founded by world champion and popular athletics commentator, Steve Cram MBE, the Salomon Kielder Marathon has become a firm favourite in the racing calendar thanks to its spectacular location and off-road course around northern Europe’s largest man-made lake, Kielder Water. Steve Cram said: “The number of participants into the Kielder Marathon weekend has grown year on year and I’m delighted with the huge success of the full weekend now that we’re into the fourth year of the event. Billed as ‘Britain’s most beautiful marathon’, the events follow the Lakeside Way, a trail that stretches right around the shoreline of Kielder Water. The organisers expect to attract runners and outdoor adventure enthusiasts from around the UK, and further afield, to the dramatic setting and unique course. With the water’s shoreline being approximately 26 miles long, Kielder Water in North East England is the ideal venue for the ultimate running challenge, the marathon, 26 miles 385 yards. Most of the course is off-road and it offers a test for trail runners, adventure racers and marathon enthusiasts alike. The Lakeside Way is a £3m project in the award-winning Kielder Water & Forest Park that forms the marathon course. It is a multi-user trail suitable for walkers, runners, cyclists, horse riders and wheelchair and pushchair users. The trail offers visitors new views and the opportunity to interact with even more of the park’s abundant wildlife and take in its scenic landscape.